14 Fall Breakfast And Blues For Seniors! We served a great meal and some down home blues at the 2018 Breakfast and Blues for Seniors. 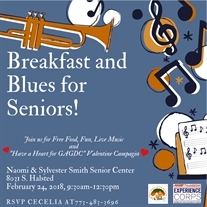 The Greater Auburn Gresham Development Corporation (GAGDC) hosted a Breakfast and Blues event for seniors on Feb. 24 from 9:30 a.m. to 12:30 p.m., at Namoi & Sylvester Smith Senior Living, 8031 S. Halsted. Help Serve Our Seniors at Breakfast and Blues for Seniors February 2018! We're serving our Seniors! Come enjoy great live blues band, food and help us in the campaign to give a heart to our seniors, during the February 2018 Breakfast and Blues for Seniors!